Manny’s March: Late to Sox; no WBC? Manny Ramirez will be late to Red Sox spring training, but the slugger may not miss much Grapefruit League action because he might skip the World Baseball Classic. Players who will be participating in the World Baseball Classic are scheduled to report to their WBC teams on March 2. Ramirez is currently on the Dominican Republic’s provisional roster, but it should not be considered a lock that he is going to play in the Classic. In fact, there is a strong likelihood that Manny won’t be on the Dominicans’ final roster when it is announced. If Manny has decided to pull out of the Classic, it’s news to Bud Selig. The baseball commissioner said this afternoon he had not yet been informed that Manny would not be participating. Red Sox general manager Theo Epstein has refused comment on his discussions with Ramirez, saying they are between the club and the player. However, it’s no secret that Manny is less than content in Boston. Ramirez again requested to be traded after last season. 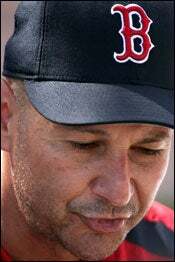 One of his representatives even communicated to the Red Sox that Manny would not report to spring training if his wish to be dealt was not met. The team recently expressed confidence that Manny would report, however. Pitcher Curt Schilling said he wasn’t concerned about the delay granted to Ramirez. “Manny’s one of those guys who if he didn’t show up for spring training I’d still know he’d be ready for the season when the season started,” Schilling said. David Ortiz, scheduled to play for the Dominican Republic, said Tuesday he had “no idea” if Ramirez still would play in the WBC, but he’s not concerned about Ramirez missing camp. “You tell me that he’s not gonna be here for the season, I understand, but this is camp. He knows what he’s gotta do to be ready,” Ortiz said. Position players are due in town on Wednesday, the day before the first workout. Boston starts its exhibition schedule on March 2 against Minnesota. Ramirez batted .292 with 45 homers and 144 RBIs last year. He said during the season (and after it) he didn’t want to stay with the Red Sox, a statement he’s made in many of his five years with the club. On Sunday, Ortiz said he didn’t know where Ramirez was. “I talked to Manny like a week ago and he was going to Italy tomorrow,” Ortiz said. He must have been joking, Ortiz decided, since Ramirez probably couldn’t get back in time for Thursday’s workout.